Hello, I'm Mark (Access A.S.A.P) a local trustworthy locksmith available 24 hours a day. If your locked out my motto is 'I wont let you down, I'll let you in'. My aim is to reach my customer within 30 minutes. No call out charge. OAP Discounts, all my work is guaranteed. 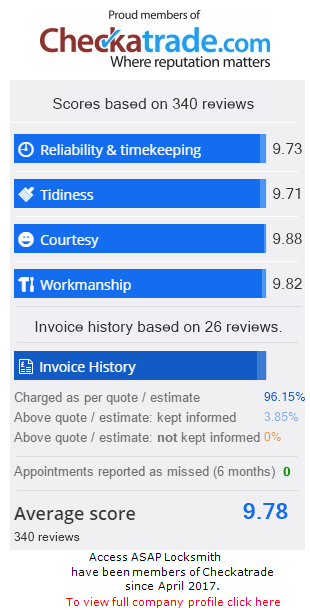 Due to our location we have built up a good reputation for reliability, competitive prices and quick response times in Wilmslow, Alderley Edge and the Handforth areas, but in fact we serve the whole of South Manchester region and still get to you quicker and cheaper than our competitors. We are Local Locksmiths Not an Agency! Access A.S.A.P is an independent locksmith service based in Wilmslow offering a professional locksmith service to both domestic and commercial customers throughout Greater Manchester, Cheshire and the surrounding areas. Call us on: 07830 352 803. To find out how Access A.S.A.P can help you with all your locksmith needs call us on 07830 352 803 or Free on: 0808 178 9993. © Copyright - Access A.S.A.P All Rights Reserved.